Unplugged • Utah campus showcasing new technology hoped to transform transportation. 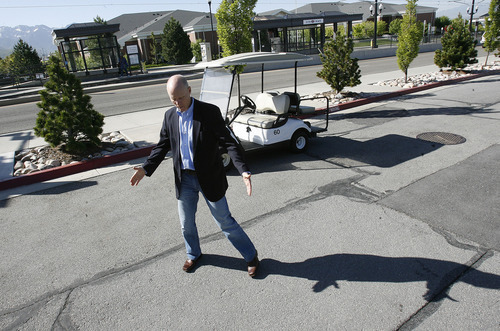 Scott Sommerdorf | The Salt Lake Tribune Wesley Smith, CEO of a Utah State startup called WAVE, describes the footprint of the poer transfer panel that will be installed beneath the asphalt just north of the South Campus Drive TRAX station. WAVE is commercializing technology that wirelessly transfers electric power. His company is building a demonstration project on the University of Utah campus that will charge electric shuttle busses without wires. Using a $2.7 million federal grant, the company will install the charging pads this summer and by winter, the U. will be operating a bus between the south campus TRAX station and the Warnock engineering complex. Monday, May 14, 2012. 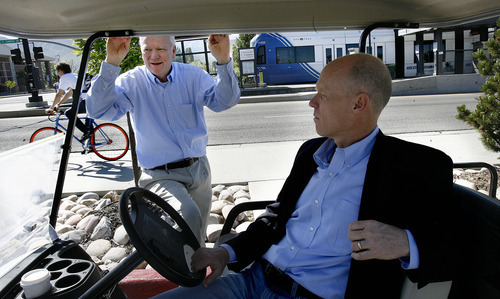 Scott Sommerdorf | The Salt Lake Tribune Alma Allred, director of Comunity Services at the U., left, and Wesley Smith, CEO of a Utah State startup called WAVE, are collaborating in the commercialization of technology that wirelessly transfers electric power. WAVE is building a demonstration project on the University of Utah campus that will charge electric shuttle buses without wires. Using a $2.7 million federal grant, the company will install the charging pads this summer and by winter, the U. will be operating a bus between the south campus TRAX station and the Warnock engineering complex. Monday, May 14, 2012. If batteries did not weigh or cost so much, most drivers might be wheeling electric vehicles by now. A new Utah State University technology could overcome this barrier to electrically powered transport. How? By transferring power through the air, from charging pads embedded in a road to a vehicle's undercarriage 10 inches above, minimizing the need for on-board power storage. This fall a USU start-up company will test the economic viability of such as wireless power transfer, or WPT, in the shuttle bus system at the University of Utah. Fueled with a federal grant, the U. is installing charging pads at bus stops and buying new electric buses to supplement its 28-bus fleet of diesel and compressed natural gas-powered vehicles. "If it's viable here, it would be viable on campuses elsewhere. We want to be a national model. It has to be safe and it has to run," said Alma Allred, the U. 's director of commuter services. "We are a research institution. We want to be in the forefront of technology that reduces the need for fossil fuels. We want to reduce emissions." The U. also wants to reduce the presence of cars and the size of parking lots on campus. The shuttle network, the state's second-largest transit system with about 1 million vehicle miles a year, is a key component. On Friday, the U. and its contracting partner finalized a contract with the Utah Transit Authority enabling them to move forward on the project. It is funded by a $2.7 million grant UTA secured from the U.S. Department of Transportation. USU's Energy Dynamics Lab developed the wireless technology as part of USTAR, the state-supported research effort designed to drive university technologies into the commercial sphere. USU licensed its patents to WAVE Technologies, now headed by Wesley Smith, who formerly worked in the university technology commercialization office. Wireless electrical transfer is nothing new. In 1900, Nikola Tesla patented such a device capable of jumping a narrow gap. But it has only been in recent years that the technology has matured to the point where it might be useful in transportation. The problem USU researchers tackled, with the help of colleagues in New Zealand, was improving the efficiency of the transfer and expanding the distance the power can travel wirelessly. Smith's goal with the U. project is to have full-service demonstration by Feb. 1 to showcase the technology to urban transit agencies, airports, industrial sites, any entity that moves people on wheels. The technology could be transformative for heavy-duty vehicles, said Smith, whose company name is an acronym for Wireless Advanced Vehicle Electrification. Electrical motors are vastly more efficient than internal combustion engines for generating kinetic force. In internal combustion engines, up to 70 percent of the energy is lost through heat and friction. But battery capacity is the Achilles heel of electric vehicles because they are heavy, expensive and slow to recharge safely. Diesel, on the other hand, carries a great deal of energy in a compact liquid form. To match the energy carried in a gallon of diesel, weighing eight pounds, you would need a lead acid battery weighing 650 pounds or a lithium phosphate battery weighing 30 pounds, Smith said. So the solution to the battery conundrum is to build systems that don't need them, Smith said. One potential customer for the USU technology is San Francisco's MUNI, which operates a network of electric buses powered through overhead wires. Charging these buses at frequent, strategic stops would not only eliminate the need for the unsightly wires, but give the system flexibility to change routes, according to Smith. At the U., a new 40-foot electric bus would be the first shuttle to run across the heart of campus. The new project will run a .85-mile route between the South Campus TRAX station north to the Warnock engineering building, with a midway stop at the student union. The U. will embed a charging pad in the asphalt near the train stop and improve a bus route over existing pedestrian paths and roadways. The bus runs will be timed to pick up passengers coming off eastbound trains on 15-minute cycles. The driver will position the bus over the charging pad during five-minute pauses between runs. The embedded pads will measure about three feet square and will pose no danger to the public. Nothing protrudes above the surface to be damaged by cars, snow plows or vandals. "It's totally solid state, there are no moving parts and it's invisible to the public," Smith said. "When the bus isn't there people can lie on it." But don't go crawling under a bus to see what happens, he added.